The topic of this research paper is the complex way in which easterners and westerners differ in their views on suicide and self-sacrifice. From the eastern perspective the focus will be on the perceived honor and nobility of the act of self-sacrifice as seen, for instance, in the ritualistic suicides of the samurai known as seppuku (see photo at right), and Japan’s Kamikaze pilots during World War II. From the western perspective the focus will be on the Judeo-Christian belief that suicide is in all instances sinful and wrong and, more specifically, that the soul of the individual that has committed suicide will never attain the fruits of the afterlife. The research paper will examine, then, the differences that exist between the western and eastern perceptions of suicide and, just as importantly, when and why these differences emerged. Inherent is this discussion will be a thorough analysis of the different religions found in the regions in question and how the oft-conflicting beliefs of these religions have contributed to the varied perceptions of suicide that we see today. In order to fully understand how the peoples of the east and west have formed such differing ideologies in regard to suicide, we must first examine when and from where these ideologies first sprung. We must, in other words, focus our attention on the roots of eastern and western thought regarding suicide by examining the unique currents of religious belief found in these geographically distinct areas. In the west, the root of opinion on suicide comes directly from the Judeo-Christian tenets found in the Bible. The basic western belief that suicide is in all instances sinful and wrong became widespread with the mass-production of the Bible in 1455. It was in this year that German goldsmith Johann Gutenberg produced the first 200 bound and typeset copies of the Bible for purchase and sale. In the years and centuries that followed, westerners became increasingly more literate as the Bible became increasingly less difficult to find. The result was a massive population of Jews and Christians who had access to the Bible and the ideas found within and who, if illiterate, could have these ideas read to them by an acquaintance. Thus we see how the Bible’s treatment of suicide - namely the blatant assertion found throughout the Bible that suicide is always wrong - became part of the ideological framework of millions of Christians and Jews in the west. Even when the Protestant Reformation of the 16th century divided Christianity into myriad sects, all the varying branches from Calvinism to Lutheranism to Catholicism still shared the belief that self-sacrifice was wrong; regardless of denomination, any Christian of the period would have argued that life can be given and taken away only by God, and thus the individual who has committed suicide has usurped a power that was never his to yield. Understanding the roots of eastern thought on suicide is a slightly more complex task. This is true because, in contrast to the Judeo-Christian tradition of the west, the religious tradition of the east has developed along many divergent paths. While Christianity and Judaism almost exclusively dominate religious thought in the west, many religions and methods of spiritual thought contribute to the rich tapestry that is spirituality in the east. Buddhism and Shintoism, as well as the spiritually-charged belief systems of Confucianism and Taoism, are just a few of the currents of religious thought that make spirituality in the east so unique. That said, the question we need to pose is this: what effect did the development of these uniquely eastern modes of spirituality have on the development of the uniquely eastern view of suicide? How, for instance, did the emergence and growth of Shintoism in Japan give birth to a culture that not only embraced the act of self-sacrifice but looked upon it with reverence and honor as well? The key to understanding how this cultural development could have taken place is found in the unique history of Asia and, for our purposes, specifically in the unique history of Japan. Long the traditional religion of Japan, Shintoism is most often associated with worship of spirits and ancestors. 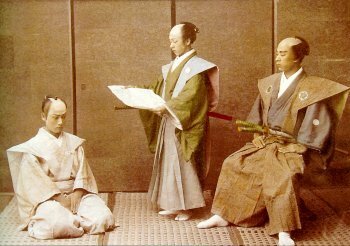 A strong argument can be made, though, that Shintoism was truly forged during the feudal period of Japanese history when the samurai or warrior class were bound together under a complex system of loyalties to the aristocratic lords of the large, landed estates known as shoen. During this period, a samurai or group of samurai were often called upon to do battle with the samurai of a competing shoen if the lords of these shoen had entered into some kind of feud. When the battle was over, the defeated samurai were left with an important choice: they could allow themselves to be captured and probably killed or they could end their lives immediately by committing suicide. Since nothing in the Zen philosophy of the samurai or the Shinto religion of Japan condemned this sort of behavior, the defeated group of samurai would usually opt for suicide; unlike their western counterparts, the Asians in this example were never taught to believe that self-sacrifice was inherently wrong. In contrast, the Buddhist state of detachment that all samurai worked toward was a spiritual method for preparing for death, whether it be in combat or via suicide. Clearly, then, the roots of eastern and western thought on suicide are inextricably linked to the development of eastern and western religion. Now that we have examined the roots of eastern and western thought on suicide, we can proceed on to examine how specific historical and cultural examples shed light on these differing ideologies. Perhaps the best place to start is, historically speaking, at the beginning. From the eastern perspective, one of the earliest historical references to suicide can be seen in the Seppuku, the ritualistic suicides of the samurai during the Heian and Kamakura periods of Japanese history (799-1333 ad.). As noted above, Seppuku took place when a defeated clan of samurai chose to kill themselves rather than be captured or switch allegiance to a different shoen. The actual act of ritualistic suicide was carried out in an extremely gruesome manner, with each samurai taking a small sword known as a tanto and slicing open his abdomen from side to side. The gruesome nature of this suicidal act, not to mention the simple fact that suicide was being committed, would have been thoroughly decried by a westerner of the times had he known such activities were taking place. The Japanese, though, viewed Seppuku as an act of extreme honor and selflessness; so great was the loyalty of a samurai to his master that he would rather die than pledge allegiance to another lord. Perhaps the greatest example of Seppuku in Japanese history occurred in the year 1702 when 47 samurai killed themselves in order to avenge the death of their lord. In 1663, the ruler of Japan, Tokugawa Ieyasu, issued a law banning samurai death loyalty, henceforth preventing a samurai from murdering a master in retaliation for the death of his own. Some 40 years later, though, the lord of the above-mentioned samurai was killed, and his warriors, true to samurai form, tracked down and killed the responsible party. Though this behavior was consistent with centuries of Japanese samurai tradition, the 47 warriors in question had committed an act that was now technically unlawful. As a result, they were given the choice to face the consequences of the law or kill themselves. All 47 chose Seppuku. All 47 chose to die when faced with a law they deemed unjust. Thus, in killing themselves, “the 47 Ronin” made an ideological stand. And, though a westerner might view this act of self-sacrifice as blasphemous and misguided, easterners saw in "the 47 Ronin" a powerful representation of courage and nobility. This eastern belief that suicide is an incredibly noble and selfless act is not seen only in the Seppuku of the Heian and Kamakura periods of Japanese history. It can also be seen in some striking instances in the modern periods of Asian history. Consider, for instance, the Kamikaze pilots of Japan during the Second World War. In late 1944, as the war in the Pacific was drastically shifting in favor of the Americans, the Japanese were in desparate need of some type of immediate advantage that would quell the onslaught of the Allied attack. They found this edge, at least temporarily, in the person of the Kamikaze, or suicide pilot. In essence, the Kamikaze pilot sacrificed his own life by steering his plane directly into American forces and supplies aboard battleships and other smaller vessels. The best way to understand how this suicide attack actually took place is to examine a specific instance of Kamikaze behavior. On May 11th, 1945, the US Battleship Bunker Hill was hit by two Kamikaze planes in a span of less than 30 seconds (see photo below). 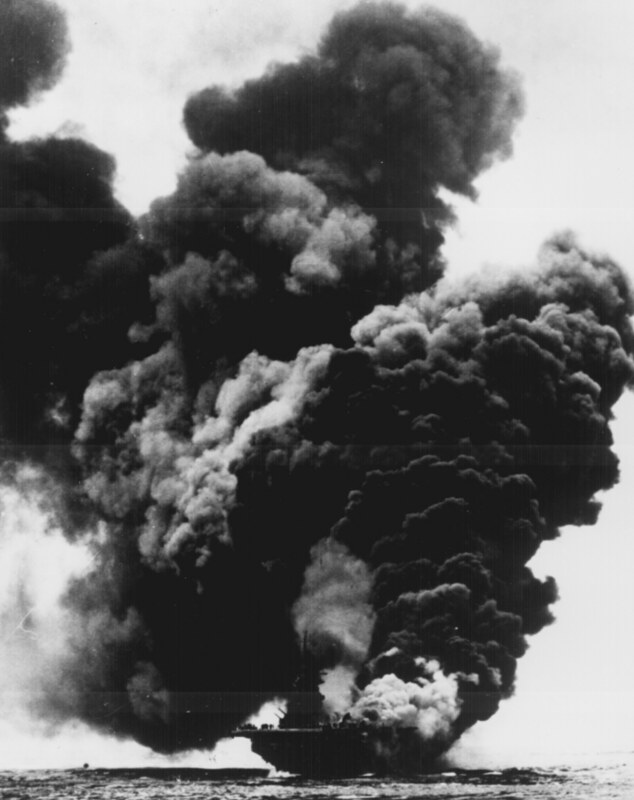 The chaos and destruction that resulted killed 346 American servicemen, wounding and stranding some 300 more (www.airgroup4.com). From a militaristic staindpoint, this sneak attack was a complete success for the Japanese; with only two Japanese among the hundreds dead (the two pilots), the ratio of Americans killed to Japanese killed was an astounding 173:1. For our purposes, though, the success of this engagement for the Japanese is less important than what the suicidal mode of the attack tells us about the eastern view of self-sacrifice. Essentially, the Kamikaze attack on the Bunker Hill - as well as other Kamikaze attacks that took place in the later stages of the war - can be viewed as a specific example of the over-arching ideology that is the eastern view of suicide. For the typical Japanese citizen, there was absolutely no element of shame or dishonor in the actions of the two Japanese men who crashed their planes into the Bunker Hill. Instead, the sacrifice of these and other Kamikaze pilots was widely regarded throughout Japan as the final contribution of truly heroic men to the greater cause of Japanese hegemony in the South Pacific; these men had made the ultimate sacrifice for their country and, significantly, they had done it with vigor and enthusiasm. It was not as if the Kamikaze pilots set out on their missions believing there was some chance they might return; these men knew they were going to die and still did so willingly. This foreknowledge of death sets the actions of the Kamikaze soldier apart from the actions of the soldier of the west. For instance, an American soldier in the Pacific Theatre would enter battle knowing he might die, but there was no sense that he was setting out to kill himself; the task at hand for the western soldier was inherently dangerous but by no means suicidal. He knew that he might lose his life in the heat of battle but, significantly, he also knew that his commanding officer and his fellow westerners back home would never ask of him the outright, suicidal sacrifice that Japan asked of the Kamikazes. The ideologies of the two regions in regard to self-sacrifice were simply too distinct. Another pertinent, historical example that helps elucidate the eastern view of suicide can be found during the Vietnam era. It was during this period of political and social upheaval that Buddhist monks began protesting the war by burning themselves alive. The gruesome footage of these suicidal acts was captured by both American and foreign journalists and, though undeniably horrifying, the footage is fascinating as well. Why, it must be asked, would any right-minded individual force himself to endure such torture? The answer to this question typifies the difference between the western and eastern views of suicide. When the typical westerner sees the footage of the Buddhist monks burning themselves alive, he sees only the superficial horror of the act and what he perceives to be the senselessness and waste of a human life. The typical easterner, though, is able to look beyond this outward gruesomeness and see the philosophical and religious underpinnings that drove the monks in question to such drastic action. For the easterner, in other words, the suicides take on a heightened level of significance and appropriateness because they represent the efforts of religious men trying to make a forceful statement about the societal ills of the times - in this case, the futility of the war in Vietnam. Though America and the west were no strangers to the idea of anti-Vietnam protests, never did the west adopt a strategy of protest as forceful or as irrevocable as that of suicide. From the western perspective, such a strategy would have been viewed as ineffective and morally wrong. So far we have examined how specific historical instances have shed light on the eastern view of suicide. Now let us examine how the Judeo-Christian tenets found in the Bible and the popular culture of the west both contribute to the western perception of suicide. The root of the western belief that suicide is in all instances wrong and sinful is, without question, biblical in origin. As we touched upon in the Historical Background section of our analysis, the Bible clearly states that God is alone in His ability to give and take away life. Thus, since any one individual has no authority over life or death, the act of suicide represents the usurpation of a power that is God's alone. To be sure, this belief that suicide runs contrary to the will of God is not found in all currents of religious thought; Hindus, Muslims, and followers of eastern religions such as Buddhism and Shintoism encounter differing views on suicide in their religious texts. For the hundreds of millions of Jews and Christians worldwide, though, the belief that self-sacrifice is inherently sinful has been engrained in their religious tradition for nearly four millenia. That said, the question then becomes, how does this long-standing belief in the wrongness of suicide manifest itself in the history and culture of the west? One of the best places to look for an answer to this question is in the popular cuture of the west, specifically in the extensive canon of literature found therein. Most of the writings of William Shakespeare, for instance, deal directly or indirectly with the topic of suicide: Romeo and Juliet, Othello, and Hamlet's significant other Ophelia are just a few of the Shakespearean characters who commit suicide. In his famous "to be or not to be" soliloquy, it is Hamlet himself who utters some of Shakespeare's most noteworthy lines on the topic of suicide. At one point in the soliloquy, Shakespeare writes that thoughts of suicide "...must give us pause; there's respect...for long life " (Hamlet, Act III, Sc. 1, 69-70). Thus we see in a famous passage in a famous 17th century British play a concrete expression of the western belief that suicide is wrong; even the powerfully depressed Hamlet "pauses" when the idea of suicide crosses his mind. He, like any upstanding Christian, must respect the gift of life and realize that suicide is sinful and wrong. Perhaps a better expression of the western view of suicide as seen through western literature can be found in Arthur Miller's 20th century play Death of a Salesman. This work of literature tells us volumes about the western perception of suicide and, significantly, how much this perception differs from that of the east. In the final moments of Death of a Salesman, the protagonist Willy Lohman kills himself by driving his car off the road because he believes that his life insurance policy will support his family in a way he never could. Though Miller lets the reader determine the relative nobility or cowardice of this act for himself, the play ends with the distinctly western feel that Lohman has somehow taken the easy way out. He has, in other words, committed a shameful act. This observation becomes extremely fascinating when one considers the fact that the typical Asian reader would interpret these events in an entirely different manner, viewing the suicide of Willy Lohman to be an act of extreme honor, not cowardice; killing oneself for the betterment of one's family would be considered a completely legitimate and honorable course of action by a man or woman in China or Japan. Support for this assertion can be found in other areas of western popular culture, most notably the medium of television. On a recent episode of the American television program Crossing Jordan, one of the show's sub-plots involved the mysterious death of a Chinese businessman in a Boston hotel (NBC.com). The American investigators on the program assumed that the man had been murdered and treated the investigation as such; they were unable to believe that a man would turn the gas fireplace in his hotel room on to the highest setting and simply wait for the fumes to kill him. Only when the wife of the deceased man arrived from China did the circumstances surrounding the case become clear. She explained to the investigators that her husband's business in China was failing and that she knew of his decision to commit suicide in America, a decision that would allow his life insurance policy to pay out and support his family indefinitely (a situation eerily similar to that of Willy Lohman). More importantly, the woman went on to explain that such behavior was not looked down upon in China and that the sacrifice her husband had made was both honorable and relatively commonplace in the city she was from. Though seemingly a flimsy source from which to derive information on the differences between eastern and western perceptions of suicide, this simple example from an American television program effectively highlights the dramatic ideological difference that exists between east and west in regard to suicide. If one were to posit the theory that the histories of the east and west have developed along extremely divergent paths, he would surely meet with little resistance from both historical scholars and interested laymen alike. To be sure, the technology of the modern era brings the peoples of the east and west closer together in both thought and lifestyle with each passing day. To be even surer, though, the cultures of the east and west remain powerfully distinct from one another even in the year 2002. It is out of this cultural distinctness that the differing ideologies between east and west in regard to suicide become historically significant. Essentially, because the histories and cultures of the east and west have progressed along such distinct lines, the endeavor of examining this progression is best undertaken with one specific topic in mind (e.g., the conflicting east/west views of suicide). In other words, in order to understand the macrocosm that is the vastly different societies of the east and west we first need to examine the microcosms that are the specific ideological differences of the peoples living in these regions. As we have seen, the difference between east and west in regard to suicide is one of the most important of these microcosms. Thus, by examining a particular issue like the conflicting east/west views of suicide, we are able to gain noteworthy incite into the broader scope of eastern and western culture; the part sheds invaluable light on the whole. Coward, Harold. The South Asian Religious Diaspora. Albany: New York Press, 2000. Ellwood, Robert S. Eastern Spirituality in America. New York: Paulist Press, 1987. Miller, Arthur. Death of a Salesman. London: Bantam Books, 1978. Ring, George C. Religions of the Far East: Their History to the Present Day. Milwaukee: Bruce Publishing, 1950. Shakespeare, William. Hamlet. New York: Grosset & Dunlap, 1945. Trevers, Nancy. Life and Death in a Japanese World. New York: Penguin Publishing, 1988. Contains information on the television show and episode I refer to in the final paragraph of the research report. Contains detailed information and photos of the Kamikaze attack on the battleship Bunker Hill. Contains information on many of the topics in my report such as the Seppuku and Kamikaze. Contains cursory information on the Kamikaze and some information on the "to be or not to be" soliloquy in Hamlet. Contains various articles on the Kamikaze.